Soft Wheat Flour, Water, Sunflower Seed Oil, Yeast. Edam Cheese (Milk, Cheese Culture, Animal Rennet, Salt, Contains Beta Caroten [for Color]), Asiago DOP (Milk, Water, Animal Rennet, Salt), Pecorino Cheese (Milk, Animal Rennet, Salt), Grana Padano DOP Cheese (Milk, Animal Rennet, Salt, Lysozyme [Enzyme from Egg White]), Tomato Pulp, Tomato Juice, Extra Virgin Olive Oil, Salt, Oregano, Pepper. For best results, preheat oven to 425°F for 10 minutes. Remove plastic wrap. Place frozen pizza directly on oven rack and bake for 7 to 8 minutes. For a crispier crust, bake 1 additional minute. Heat on high for 4 to 5 minutes or until heated through. Microwave times may vary depending on wattage. As a serving suggestion, Trader Joe’s recommends lightly drizzling your pie with olive oil and sprinkling with some fresh ground black pepper – after baking. We found this extra step gave the pizza a nice flavor boost and a little kick of spice. Feel free to add your favorite spices and garnish (e.g. dried oregano, pepper flakes, garlic powder, etc.). We love pizza. We make it at home, order it in, eat it at restaurants, on the go, for dinner, lunch or breakfast. Seriously, we’re never not in the mood for pizza. To our delight, Trader Joe’s has an entire section dedicated to frozen pizza, and we can’t wait to work our way through every option. 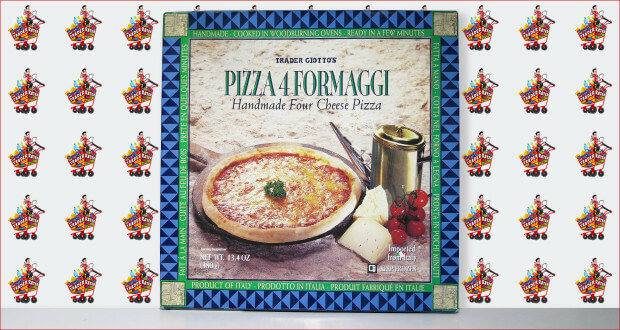 First up is Pizza 4 Formaggi – a handmade pie made with four cheeses (two of which we’ve never heard of – Edam Cheese? Grana Padano DOP Cheese?). Sadly, the results were a bit mixed. On the one hand, the blend of cheeses added some good complexity and taste, but on the other hand, the crust was very bland, and left us wishing for more flavor. A quick check of the ingredients, and it’s easy to see why – there’s no salt added into the crust. 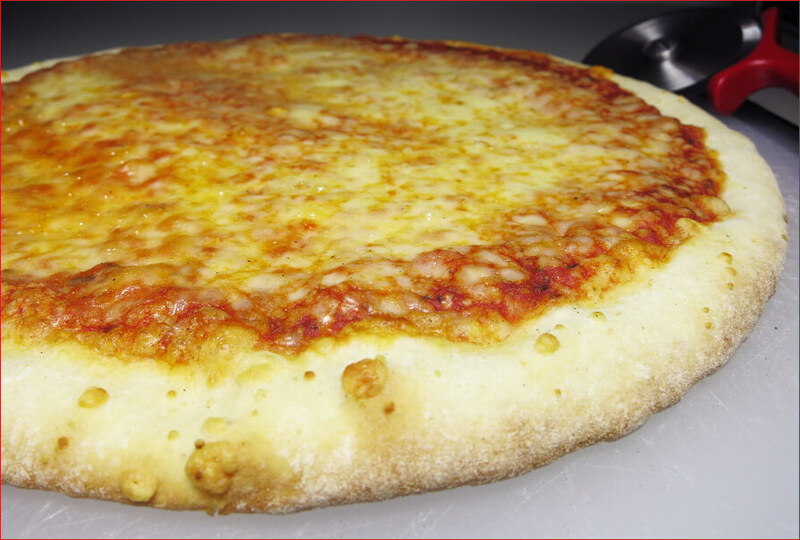 In our opinion, there should have been a little less salt added to the cheeses (we found the topping to be a bit too salty), and a little more salt added to the crust. That might have resulted in a more balanced pizza with a more flavorful, enjoyable crust. All told, this was a very standard pizza. Not necessarily disappointing, but nothing special either. In truth, a pizza would have to be pretty terrible for us to rate it as “Can It”, but that doesn’t mean they’re all winners. While this one slipped just over the bar, we likely won’t be buying this frozen pizza again. Summary : While this pizza was not necessarily disappointing, it was nothing special either. A more balanced introduction of salt into the recipe might have helped, but as is, this Pizza 4 Formaggi edged in just over the bar.